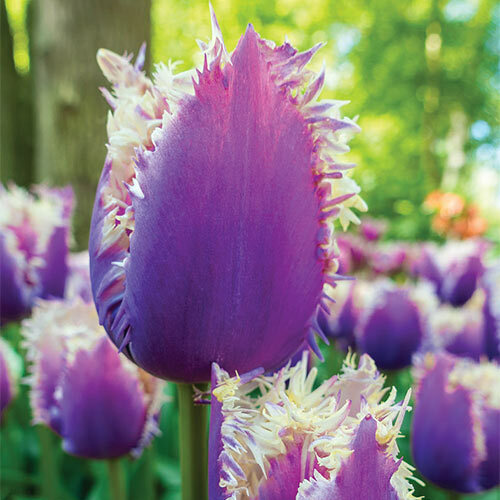 Eye-catching form and lovely color come together in one striking tulip! Cummins is a totally unique variety that makes quite a scene in both borders and beds. Its stylish bell-shaped, purple-blue blooms are lavishly adorned with stunning white fringe-it's like nothing else you'll find in run-of-the-mill garden centers. Place them in sunny sites with well-drained soil and they'll thrive, producing plenty of exotic blooms that can be enjoyed in outdoor spaces and indoors in fresh floral arrangements and bouquets. Their moderate 20" height makes them more able to withstand seasonal rains and wind. Cummins is tolerant of many different soil types and requires minimal care and maintenance. 4 to 4.5" egg-shaped flowers with heavily fringed edges.